A former NFL player was fatally shot over the weekend in a dispute with a neighbor over a parking space, according to police. Anthony "T.J." Cunningham, a former defensive back for the Seattle Seahawks and an assistant principal at a high school in Aurora, Colorado, was allegedly shot by a neighbor on Sunday and taken to local hospital, where he died the following day, according to the Arapahoe County Sheriff's Office. Police charged his neighbor, 31-year-old Marcus Johnson, with first-degree murder on Monday, accusing him of shooting Cunningham multiple times in the head and chest. Witnesses said the two neighbors met at a high school in Aurora, located about 10 miles east of Denver, to settle an ongoing parking dispute, according to a probable cause affidavit. Cunningham's brother told police he accompanied the former player to the school's parking lot, where the two planned to "box it out," according to the affidavit. The two men were walking towards each other when Johnson allegedly shot him three times, striking him in the head and chest, according to the document. Johnson called 911 to report the shooting and police said they found a handgun in his vehicle. Johnson said Cunningham was armed with a bottle when he pulled the trigger, but Cunningham's brother said he didn't have a weapon, according to the affidavit. Johnson was originally booked on attempted murder, but the charge was amended after the victim's death. He was being held without bail and it's unclear if he has retained an attorney. Cunningham, 46, played for the Seahawks during the 1996 season until injuries ended his NFL career, according to the team's website. He also played wide receiver and defensive back at the University of Colorado. 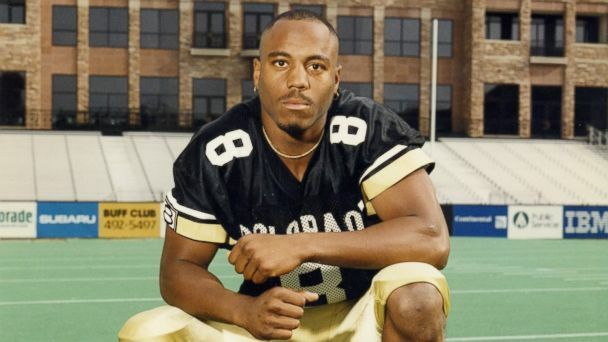 The university's football team said he was a "tremendous part of the CU community" who "touched countless others" during his time there, according to a statement. "We were deeply shocked and saddened to learn of the death of T.J. Cunningham," the Colorado Buffaloes said in a tweet on Monday. "He was a good family man and had a strong passion for working with young people."